The Intersections & Beyond: The Loboc Children's Choir performs in a concert and in PETA's "Ang Post Office"
The Loboc Children's Choir performs in a concert and in PETA's "Ang Post Office"
Voices, so pure and angelic, burst through the gathering silence and darkness of the tropical evening as thirty children get together for their daily choir rehearsals. Most evenings like this happen at the center of the small town of Loboc, the 'Music Town' of the island Province of Bohol. The children – The Loboc Children’s Choir. 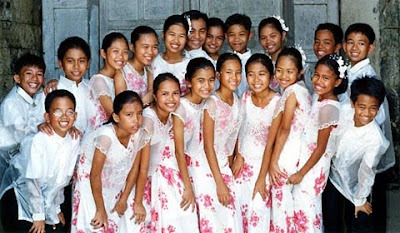 The Loboc Children's Choir started as an ordinary school choir, established to perform during school and community events. Composed of thirty schoolchildren between nine and thirteen years old, who all attend the Loboc Central Elementary School, the choir has blossomed into one of the most outstanding choirs in the Philippines today. The choir garnered two major awards in 2003 for the Europe and its Songs 6th International Folksong Choir Festival. It earned itself the First Prize in the Children's Choir category and was likewise awarded the Europe and its Songs 2003 Cup award for having achieved the overall highest mark in all categories, surpassing the marks of twelve other international choirs. The choir has also excellently promoted the country and it's hometown Bohol through their concerts and productions in the USA (1996, 2008), Europe (2003), China (2000, 2005, 2007), and Korea (2004), and has held very successful concerts in Netherlands, Belgium, Spain, Italy, Austria, Hungary, Czech Republic, Germany and Switzerland. Luckily, the disarming choral, dubbed as the 'cultural treasure' of their home province, is having a short trip in Manila. For the two weeks that they are here, their voices will echo brightly within the walls of Quezon City’s newest artistic hub – The PETA Theater Center. It is in this venue where they will perform a live vocal score for PETA’s newest play, Ang Post Office, and present a concert of their own. For their concert, the choir will be singing a combination of classical, folk, modern, pop and show choir pieces as well as special numbers with two other local artists, Noel Cabangon and Bodjie Pascua. As a live vocal choral for the play Ang Post Office, the choir will be chanting and singing songs that are inspired by the fusion of three musical motifs: Philippine Ethnic styles, Asian Modes and Western Music. In its twenty-three years of existence the choir has received great adulation and admiration from an overwhelmingly impressed local and international audience. 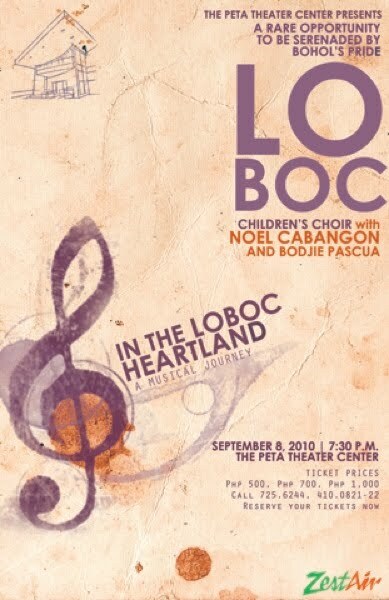 However, the Loboc Children's Choir is not only heard in concert halls or auditoriums, but also in prisons, hospitals, orphanages, and homes for the aged, where its music of hope, love, and joy also find its meaning. The award-winning choir will perform for PETA’s Ang Post Office on the following dates: September 3-6, 10-12, Friday, Saturday and Sunday, 10:00 A.M. and 3:00 P.M. Their concert titled ‘In the Loboc Heartland’ will be on September 8, 2010, Wednesday, 7:30 P.M., at the PETA Theater Center (No 5 Eymard Drive, New Manila QC). This project is supported by Prince Claus Fund for Culture and Development, National Commission for Culture and the Arts (NCCA), UNESCO Commission for the Philippines, MISEREOR/KZE and Zest Airways Inc.
For inquiries and reservations, please call PETA Marketing and Public Relations at (63 2) 725-6244, (63 2) 410-821 or (63 917) 804-4428.